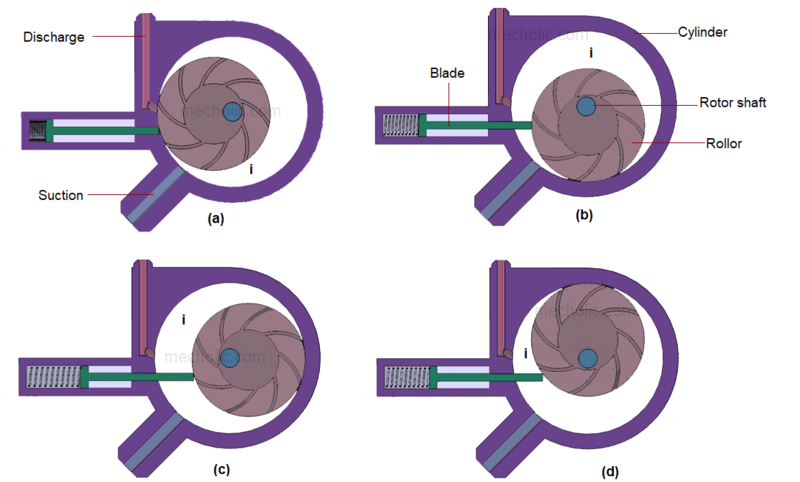 Figure shows a single stationary blade rotary compressor. In this type, a roller (impeller) is fixed on an eccentric shaft rotates in a stationary cylinder. The shaft is run off-centre so that roller rolls around the cylinder wall. The tolerance between the rotor and cylinder is very close. A spring-loaded blade (vane) is set into the slot of the cylinder. Blade moves up and down in slots in such a way that it will be always in positive contact with the roller while it rotates. The blade machined so that it restricts the fluid flow between intake and discharge side. This blade separates the suction and discharge port of the compressor, so the blade is also known as sealing blade. The roller is directly connected to the motor shaft, so it rotates at the same speed as the motor. The above figure shows various positions of the roller during the working of a rotary compressor. As the shaft turns the roller rotates around the cylinder, intake the fluid through the intake port and compress it at compression side. The result will be similar to the reciprocating compressor. Figure (a) shows the intakes stroke and beginning of compression. Suction is open and the discharge is blocked by roller itself. The trapped fluid is then getting progressively compressed by the decreasing annular space between the roller and cylinder. When the roller rotates the fluid (refrigerant) ahead of the roller get compressed and push it towards the discharge (figure (b)). The pressure increases until compressed fluid forced out through discharge port. Figure (c) shows the roller is at the mid position during that time, it continues to deliver compressed fluid at discharge and more fresh fluid is drawn into the cylinder. Figure (d) shows the end of the compression, where most of the compressed fluid is discharged. The cycle continues, in this way low-pressure fluid is getting compressed and deliver at the output of the rotary compressor.